OVERVIEW: In a scarred and brutal future, The United Commonwealth teeters on the brink of all-out civil war. The rebel resistance plots against a government that rules with cruelty and cunning. Gifted student and Testing survivor Cia Vale vows to fight. But she can't do it alone. This is the chance to lead that Cia has trained for - but who will follow? Plunging through layers of danger and deception, Cia must risk the lives of those she loves - and gamble on the loyalty of her lethal classmates. 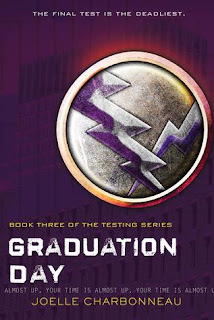 FORMAT: Graduation Day is the final book in The Testing Series. It is a YA dystopian novel with action, adventure, political intrigue, and a revolution. It stands at 304 pages and was published June 17, 2014 Houghton Miffin Books for Children. ANALYSIS: I have followed The Testing Series by Joelle Charbonneau since the first novel was released in 2013. The first novel, The Testing, was alright, but didn't really separate itself from the pack of YA dystopian novels that have been released in the wake of the popularity of The Hunger Games. The second novel, Independent Study, took the series to another level and it seemed that some elements – character development and plot progress – took a back seat. However, despite the problems with Independent Study, I continued the series to see how it ended. So, does Graduation Day redeem the series? Overall, I would have to say no. Graduation Day is the final chapter in The Testing Series. Unfortunately, instead of providing closure and a sense of completion, it leaves readers with a disappointed feeling and a total sense of incompletion. Even though The Testing Series didn't really stand out from other dystopian novels, I still had high hopes that the series would ultimately end on a high note. Graduation Day, which should have been amazing by all accounts, was confusing and a bit weighted down. It moved at a sluggish pace and there was a lot of unnecessary plot twists thrown into the mix. One of the biggest drawbacks of Graduation Day was the constant need to have every character or group comes across mysterious by questioning their motives or alliances. Cia, our main character, is constantly questioning everyone on whether they are on her side or against her. Keeping characters a mystery does add to the plot, but it started to come across that every person was having their intentions questioned just to drag things out a big longer. This was pretty obvious when established main characters, who were obviously on Cia's side, were being questioned. There was also a huge plot issue which made it extremely difficult for me to overlook. The plot of Graduation Day revolves around the President entrusting Cia with the task of saving the world. Why does she do this? She does this because there isn't one person in the entire world that the President trusts and Cia, a random teenager she has known for 2 weeks (tops), is the only person she can trust. The minute this became a focal point of the novel, it just made it difficult for me. I struggle to see how someone the President barely knew could be so important to the well-being of the entire world. I understand sometimes you have to suspend reality to enjoy books, but this was just too much. Of course, this could also result from my issues with Independent Study – where Cia was all-knowing, all wonderful, and just perfect in every way. That leaves me with the ending. I am not sure if the book was ended in a way that would allow for more books to be written or what the thought process was, but there was no closure. I walked away thinking 'that is it? It can't possibly be it.' There is a lot that is unresolved and really like the book just sort of ends. I will say that Joelle Charbonneau can write some pretty good, intense action scenes. It was one of the things that kept me coming back to the series. Unfortunately, the rather weak character-building and seemingly random/unnecessary plot twists allowed the action scenes to take a back seat. The Testing Series might be good for its intended audience. However, if you are looking for something unique or even a slight twist on the dystopian genre, it isn't going to provide it. It keeps its cookie cutter dystopian classification all the way to the end. Overall, The Testing Series was a disappointing read. When I completed the first book, I just enjoyed it. The second book left me confused and rather unsure of what to feel, but this third – and final – chapter confirmed that this series just didn't end well. I didn't feel anger or outrage, I just felt a sense of 'good it is over' and of course I felt disappointment. I wouldn't discourage people from reading the series, but I don't know if I'd readily recommend it to people either.